Asiana Airlines’ shares continued to rally on Friday, soaring 14.3% on the day and capping a 45% surge in its stock price in little over a week. Investors were very pleased with the carrier’s first quarter earnings and the outlook is equally strong. 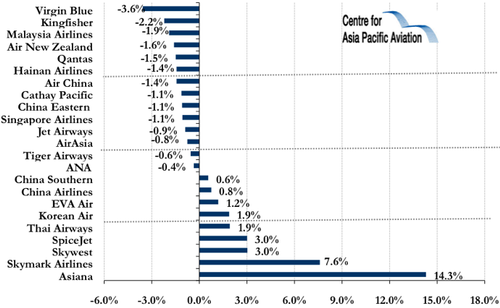 Investors are also seemingly undeterred by domestic market share gains by Korea’s budget airlines. The Transportation Ministry reported on Sunday that Jeju Air, Jin Air, Air Busan and Eastar Jet had a combined 34.2% market share in 1Q2010 – the highest level since the first Korean LCC took to the skies in 2005. See related report: Can South Korea’s LCCs survive a sea of red ink? Japan’s Ministry of Land, Infrastructure, Transport and Tourism announced on Friday that Tokyo Haneda Airport’s fourth runway and the new passenger terminal use will open on 21-Oct-2010 and the first international scheduled operations will commence on 31-Oct-2010. 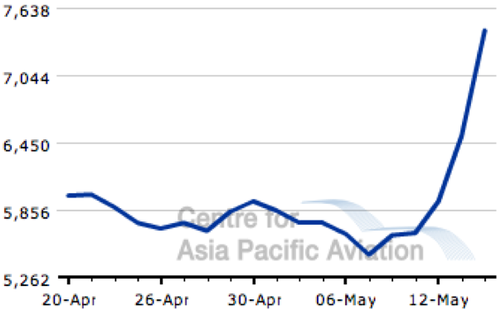 Budget airline Skymark Airlines, seen to be a beneficiary of Haneda’s expansion, surged 7.6% on Friday. The airline last month applied to commence charter services between Tokyo Haneda and Guam later this year, as JAL reduces capacity on the route. Skymark intends to operate eight return services on Wednesdays and Sundays between 4-28-Aug-2010 with B737-800 aircraft – its first international route. The airline is reportedly planning to expand to other destinations in the Northern Marianas Islands and to points beyond in the US. Meanwhile, Japan Airlines has reportedly decided to delay part of its early retirement programme due to a larger number of applications than expected, according to Kyodo News report. The carrier is concerned the retirements could affect its operations over the peak Summer season. JAL called for 2,700 applications for the programme in Mar-2010 (and received 3,610), as part of moves to slash 16,000 jobs by the end of Mar-2011. Elsewhere, Virgin Blue dropped back 3.6%, while Qantas, Cathay Pacific and Singapore Airlines declined 1.5%, 1.1% and 1.1%, respectively.